Patient-reported outcomes (PROs), from specific symptoms to health-related quality life, have been important outcome measures in pulmonary rehabilitation for a long time and paved the way for their use in clinical research in general. 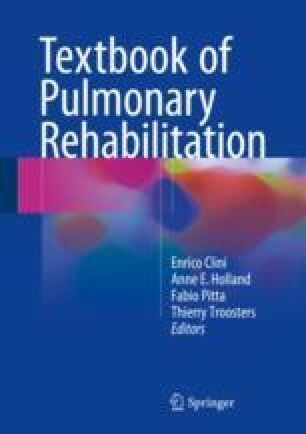 The Chronic Respiratory Questionnaire and the St. George’s Respiratory Questionnaire are the most commonly used instruments in trials of pulmonary rehabilitation. While the development process of PROs received less attention than the validation of PROs, recent developments including guidance from regulatory agencies emphasize the need of a thorough development process including patient input as a basis for the validity, reliability and responsiveness of PROs. The selection of a PRO instrument is greatly facilitated if the systematic approach, presented here, with predefined criteria about the content, measurement properties and practical aspects is followed. US Department of Health and Human Services; Food and Drug Administration. Guidance for industry: patient-reported outcome measures: use in medical product development to support labeling claims. 2009. http://www.fda.gov/downloads/Drugs/Guidances/UCM193282.pdf. Accessed 24 Oct 2016. European Medicines Agency. Committee for medicinal products for human use (CHMP). Reflection paper on the regulatory guidance for the use of health-related quality of life (HRQL) measures in the evaluation of medicinal products. 2005. http://www.ema.europa.eu/docs/en_GB/document_library/Scientific_guideline/2014/06/WC500168852.pdf. Accessed 24 Oct 2016.